Like Bencharong ware, Lain Nam Thon ware is a polychrome porcelain made in the city of Jingdezhen (the porcelain capital of China) and richly decorated to Thai tastes with bright enamel glazes. It is thought that Buddhist books and paintings were supplied as references and sent to Guangzhou merchants, who acted as intermediaries to the Chinese potters and decorators for foreign orders. As with Western orders, new, alien ceramic shapes were communicated by maquettes in wood or perhaps metal. After the fall of Autthaya to the Burmese in 1767 Lain Nam Thong wares superseded Bencharong wares as the exclusive wares of royalty. 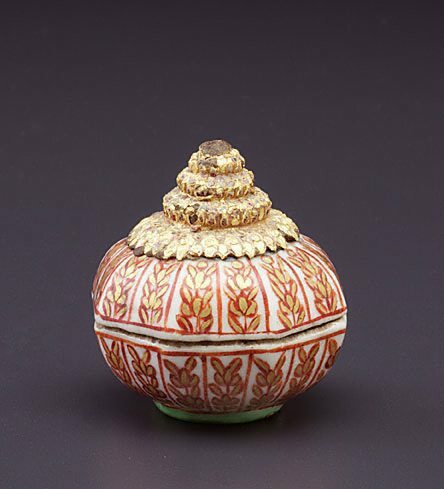 While closely related to Bencharong wares, Lain Nam Thon wares are distinguished by their use of gold in either the main pattern or background. Jackie Menzies, TAASA Review , 'The Nanhai Trade', pg. 4-7, Sydney, Mar 2004, 4-5, 6 (colour illus. ), 7. The Asian Collections Art Gallery of New South Wales , 'Export Ceramics', Sydney, 2003, 143 (colour illus. ).